Well, that’s Melbourne for you. Actually, I much prefer summer when it’s masquerading as autumn, so this title should not be taken as an aspersion on my lovely city’s lovely weather. This post is a bit late, and will probably get later again, because my week has been eaten by a combination of grant applications by day and music by night – the King’s Singers are in Australia for the first time in 28 years, and I went to their Masterclass yesterday (I was in the third row, too – *swoon*), and then a friend very kindly bought me tickets to their concert tomorrow as an early birthday present, which has me bouncing off the walls with excitement and not doing a very good job of talking about anything else. My scientists are quite amused. All of which is straying terribly away from a really lovely market day with so many gloriously coloured fruits and vegetables, and several vendors I hadn’t met before. 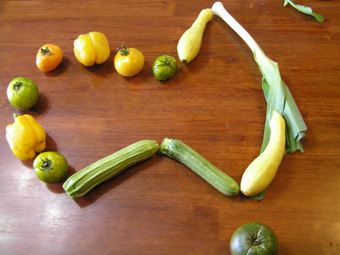 Why are there so many songs about vegetables and what’s on the other side (of the plate)? Kermit wants to know. So do I. By far the most exciting thing about Sunday’s market was the presence of a new stallholder who specialises in stone fruit. The one thing I’ve found disappointing about this market is the fact that they have basically one stall selling apples, pears, and the odd quince; one selling oranges and blood oranges and tangellos, and the odd stall selling berries in season. This was one of the things I mentioned when the market convenor asked me what stalls I’d like to see more of, so I was delighted to see a stall full of peaches, nectarines, apricots, and plums of many colours. 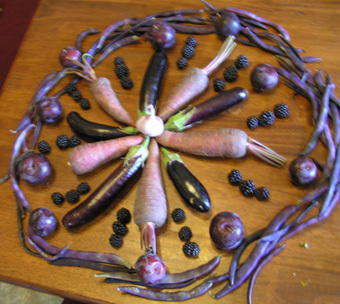 Many people are unaware that purple food is quite fond of folk dancing (unlike red food, which is more into marching bands). 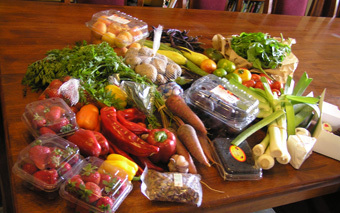 The stallholder made a quite determined effort to either get us to buy everything or to come and visit his orchard (where, no doubt, we would be even more strongly encouraged to buy everything). We may do that sometime. 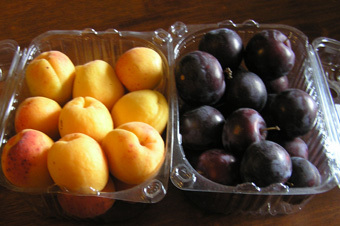 I was simply thrilled to get the very last apricots of the season and blood plums like the ones I grew up with. Though the bright yellow plums very nearly seduced me. Maybe next fortnight. 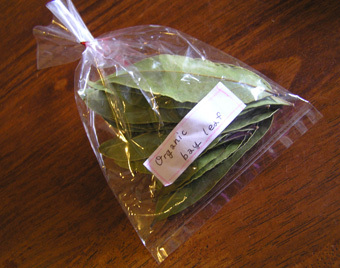 I had eggs, so I didn’t really need to visit the egg-man, but he also had freshly dried bay leaves (is that even possible? ), which is something I haven’t seen before. I actually have an ancient roman recipe for little cakes (biscuits, really) with a bay leaf pressed into the base of each, so I know just what I’ll be doing with these. Also, they were rather pretty. All the puns I could come up with to caption this photo were so bad that even I wasn’t willing to put them in this blog. 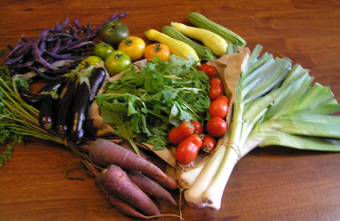 We are now on the opposite week from my lovely Italian lady, and will be until May, when we will be back in sync with her, just in time for the cardoons. So no more quail eggs or zucchini flowers just now. 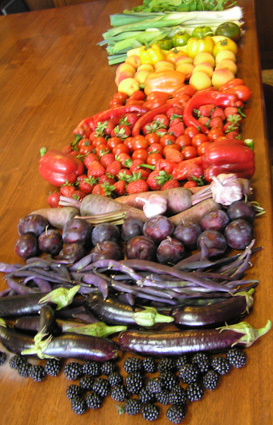 But my colourful vegetable stall was back in force, with tomatoes of many colours, purple beans, yellow and striped zucchini, baby leeks, pink-purple carrots, roma tomatoes, lebanese eggplants, and rocket. I bought… pretty much some of everything. 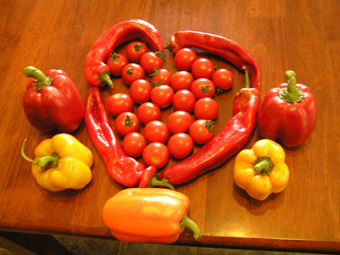 The tomato lady was back, which meant that I had to buy even more tomatoes, and also capsicums, because I really love those long red ones, and our supermarket and greengrocer don’t tend to have them. 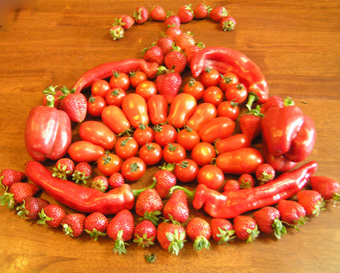 Tomatoes, peppers and strawberries, looking strangely menacing. It’s like this army of vegetables and strawberries, coming to get you. Beware! There was a chap there selling lots of different kinds of pistachios and insisting we taste them all. This was actually fairly fascinating, until I realised that my favourites of the lot were the boring variety that everyone sells. I am such a pleb. 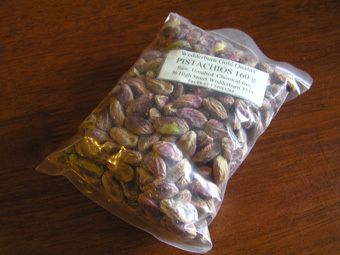 Plebean pistachios. You’d never catch a roman emperor eating one of these, even if the skins *are* purple. This is not my foodie badge. Though it is vaguely reminiscent of the Illuminati. 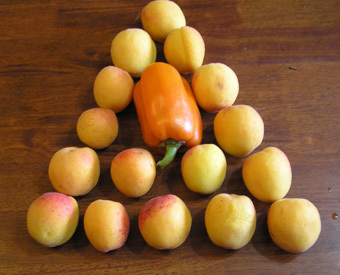 Are the apricots engaged in some sort of government-undermining conspiracy? Should someone tell the capsicum to watch its step? Or is it, in fact, the ringleader? Potato man’s wife was here again this week. Apparently, they don’t have any purple potatoes this year, which makes me very sad. They do, however, have pink-eye potatoes, which are apparently very popular in Tasmania. The stallholder told me that they keep on getting people asking if they have pink eye. I expressed concern for the poor potatoes with conjunctivitis, and she looked at me as though I was slightly insane. Clearly she doesn’t know me very well, or she would realise that I am far more than *slightly* insane. 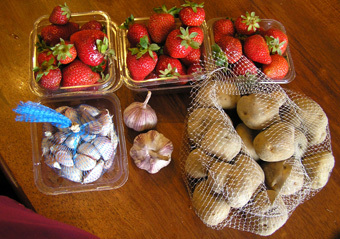 She also had their wonderful strawberries and garlic again. I’ve been getting the impression, from one thing and another, that strawberries and garlic grow well together. People seem to sell them at the same stalls a lot, at any rate, and Diggers wanted me to put them in the same patch. I don’t need three punnets of strawberries. But if they will price them at $10 for three, what’s a girl to do? 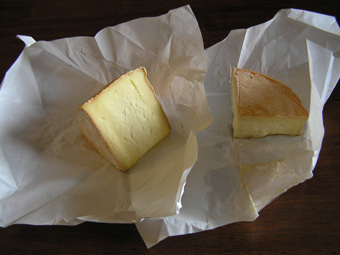 Cheeeeeeeeeese. Yeah, I really like this cheese, stinks and all. And then, because we had been very, very good marketers and bought our fruit and vegetables and still had some money left, we were allowed to buy CAKES. It’s not that I can’t make cupcakes. 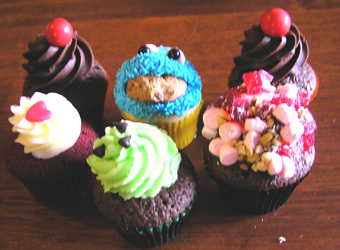 It’s that these cupcakes are irresistibly cute. 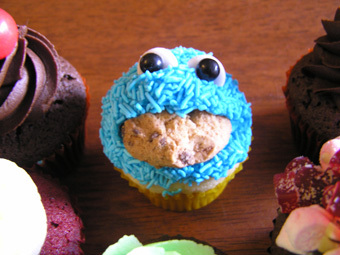 And really, I have to end with a close up of the Cookie Monster cupcake, because I really do think that is the most awesome cupcake ever. I’m going to have to make some myself, I think. Maybe some other muppets too, but hehas a cookie in his mouth. How awesome is that? Very awesome. Can you deny it? Of course you can’t. 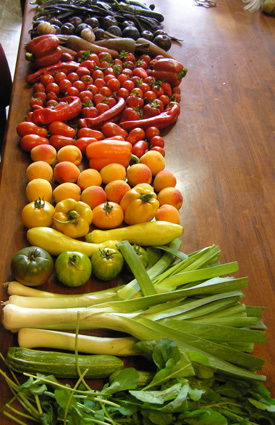 This post makes my mouth water – fantastic shots of some really lovely looking vegetables.